Why do MERCER&SONS shirts have such a distinctive look? Our SoftCollarstm are without peer, immediately recognizable by both traditionalist and aficionado alike. As Bruce Boyer attests, "Mercer is the original". Why? 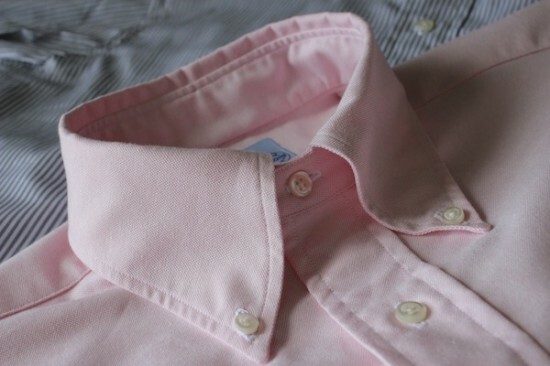 Our button down collars are unlined, and our straight collars only lightly lined and unfused. As a result, both the full roll of our button down and the relaxed look of our soft straight and modified spread collars will not be mistaken, offering a truly distinctive, sophisticated look, ideally suited for both dress and casual wear. Only an unlined neckband and hand-turned collar can match the individual contours of each person's neck, thereby producing the comfort and look of our SoftCollarstm for which we are famous. Our skilled shirt makers artfully create the MERCER&SONS collar providing years of comfort and wear so fully appreciated by our discerning customers. 'Absolutely love your oxford button down. Best shirt, ever. So comfortable. like a good fit, did a taper at the waist, as you suggested, and it’s perfect. I love the cut, and I don't want the shirt ever to wear out. My wife loves it, too. Distinctive also is our trademark six-button front placket. Again, form follows function, and our button spacing, unlike others, is the gentleman's choice, providing just the right natural drape, unbuttoned, and enabling even our dressier shirts to be worn casually, by themselves, or with sport coat. Also distinctive is the slightly offset button placement on our barrel cuffs. 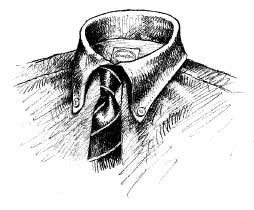 In days past, cuffs were often rolled over, to prevent the cuff edges from the dirt and grime of offices a century ago. Not an issue today, but a detail which does offer a bit more room for the wider watch cases of today. MERCER&SONS shirts are individually hand cut, not computer generated and computer cut. Hand cut, hand crafted, because the making of a good shirt is an art, not a science. We stock blue and white two-ply Pima Cotton oxford button downs in sizes 14 1/2 to 17 1/2, and make up all others, as ordered. Given varying tastes and shapes, we are able to accommodate modifications to our fit, but we will not compromise our basic style, which is distinctive and immediately recognized across the world. Why do MERCER&SONS shirts last twice as long as the finest British, Italian, and other specialty store shirts? Why are your shirts such a good investment? Short-sighted economics is not an issue for us. Good taste, maximum comfort, honest value and long term customer satisfaction demand special cutting procedures, with no short cuts or skimping on materials or labor. Only our unique patterns and experienced cutters can guarantee you the degree of comfort you deserve, comfort which will make you a MERCER&SONS customer for life. What are some of the other details which make MERCER&SONS shirts stand out? Our pima cotton oxford cloth is two-ply and yarn-dyed. Rather than dyeing large lots of piece goods, our yarns are individually dyed before the cloth is woven, ensuring the distinctive look and long lasting qualities we require of our shirts. It’s well worth our extra cost and effort. ultrapima tm two- ply oxford cloth is the most durable dress shirting fabric made. Rather than wearing out or pilling, our oxford cloth shirts only improve over time, aging well. You use the finest oxford (and other Italian and English broadcloth fabrics) available. What are some of your constuction secrets? First of all, highly skilled and dedicated seamstresses can actually take advantage of the specialized techniques of fine custom tailoring, particularly those details which create exquisite appearance and long-lasting qualities. 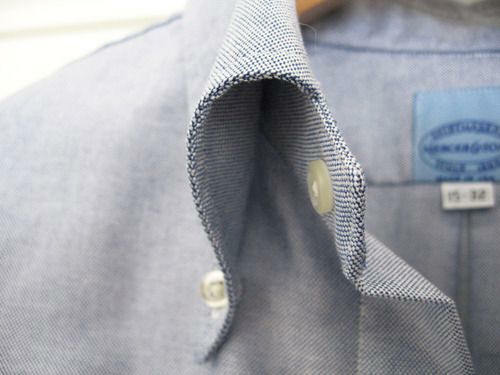 For example, each shirt is made with single needle craftsmanship throughout, including side seams. Why does MERCER&SONS use single needle stitching exclusively? Single needle stitching offers a neater appearance (it never puckers or suffers from cockling) and more strength; it is, however, a much more expensive operation. Double needle stitching is a one-part operation requiring little skill. 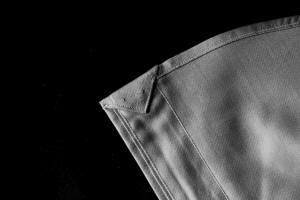 Single needle stitching, especially on the side seams, requires not only the experience of highly skilled custom shirt makers- but twice as much time, as single needle stitching is, in fact, a two-step, laborious procedure. Our hand-made shirt cannot be compared to that produced by double needle shirt factories. What other details help to distinguish MERCER&SONS shirts? Twenty stitches per inch top stitching, extremely fine, 1/32 inch edge stitching, "pearl edge" cross stitched buttonholes with 164 stitches, and our signature "v" turn up at the bottom of the front center placket are some of the details which make an obvious difference in the final product. You and your small company take real pride in MERCER&SONS shirts. Each shirt is important to us, as we know it will be to you. We take tremendous pride in the fact that we offer our customers a hand-crafted, American made shirt, at a good price. Made in USA works for us, and will work for you. Our trademark SoftCollarstm .Made in U.S.A Since 1982. Authentic Ivy League Look. G.Bruce Boyer. 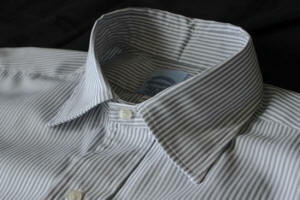 Unlined, Non-fused, Classic Full Roll 3 7/16" Button Down Collars. Better than Brooks Brothers. Two-Ply, Yarn-Dyed Pima Cotton Oxford, 2 7/8" Straight Point Collars, Generously Cut. Exceptional Comfort. Traditional Good Looks. Hard-to-Find Sizes, Sea Island Broadcloths, English and Italian Superfine Shirtings, Solids, Stripes, Checks, Plaids, French Cuffs, Contrast Collars, 'J.Press' Flap Pockets, Big and Tall Sizes, Single Needle Stitching. Custom Tailoring. Impeccable after 150+ Launderings. Classic Pima Cotton Oxford Boxers. All American Made. Guaranteed to Outlast All Others.